For centuries the people of Ecuador have shared wild sounding stories of legendary ancient cities supposedly lost to the jungles. Many of these stories are based around the reasonable hypothesis that a number of Inca settlements have been swallowed up by the expansion of jungle areas, and the stories are kept alive by the tantalizing prospect of large amounts of gold hidden in these few urbanized areas that did not fall to Spanish hands. We can say for certain that unlike Peru, it seems Ecuador has not had many recognized finds of significant ancient urban settlements. Many local legends claim there was once a civilization here that was known for the giant size of its people. The idea of lost cities of giants in the jungle has until present remained largely a matter of myth and legend with only some solid evidence to support it as possible fact. Most notably are the finds consisting of bones here that are from humans of extreme height, well over two meters tall in some cases. It would seem now that these legends are at least somewhat based in fact. The total size of the complex located is uncertain. A layer of soil has built up and covered structures at the site and then tropical foliage has taken root making buildings indistinguishable from the background of jungle plants. 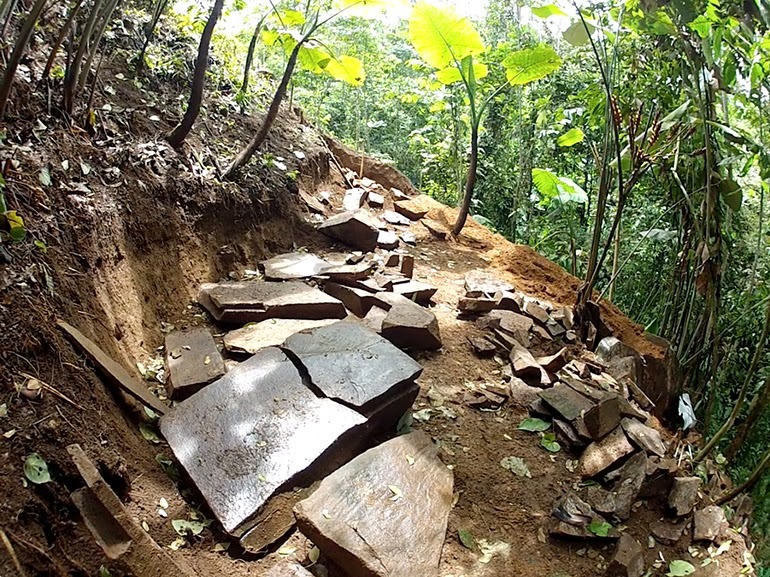 By good fortune, a landslide induced either by heavy rain or by an earthquake brought down all of the material covering one side of a large pyramidal structure. One witness we interviewed projected that the approximate size would be around 80 meters square at the base with steep inclined walls rising to about 80 meters in height. He noted several nearby ‘hills’ of equal proportions, which appear to follow astronomical alignment, and assumes these are all pyramids. 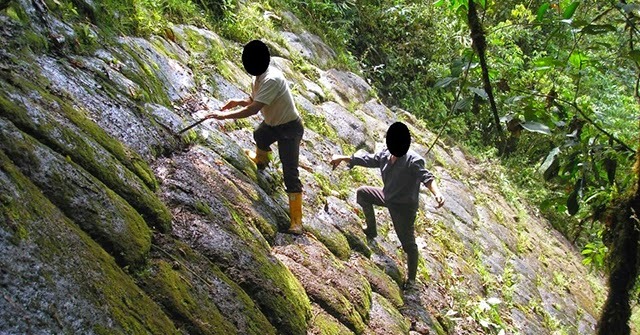 The second witness, a scientist, estimates that the large megalithic stone blocks making up the structure are each around two tones in weight; many hundreds of such blocks make up the pyramid. The blocks are cut into irregular shapes and sizes, cleverly interlocked, and possibly cemented into place. The pyramid is not the only interesting find at the location as many artefacts were strewn around, including a number of stone tools, seemingly types of hammers. There was also ceramic and pottery, as well as various other shaped stones and strange objects. 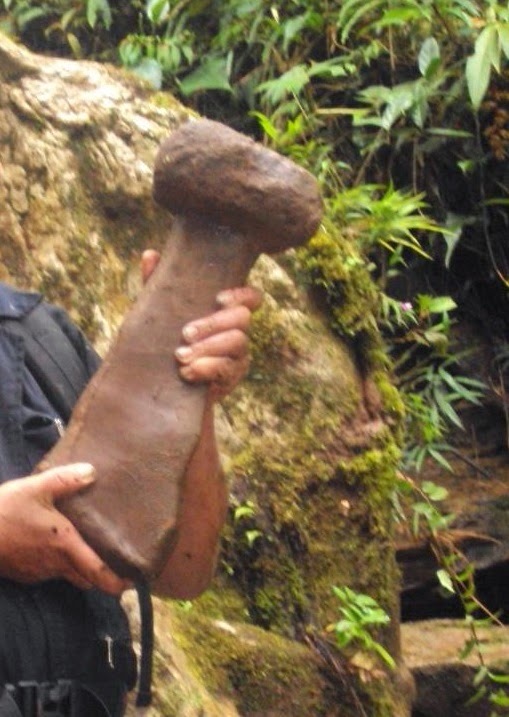 What points towards this habitation having possibly housed a race of giants is the presence of extremely oversized hammers, or at least the stone hammerheads. Many of these objects appeared to be stone tools that could have been used either in mining or refining some kind of metal ore. Assuming these were attached to hard wood handles they would be of both incredible size and weight, making their use as tools impractical for a typical Inca or indigenous Indian, these being generally slight built people of around five foot or so. What known civilization on Earth would make hammers like this and use them as a real tools? Keep in mind that any work would be done in the incredible heat and humidity of the Amazon jungle. How long could anyone swing such a thing before collapsing from heat exhaustion? These oversized artefacts don't seem to fit with anything known in Inca archaeology, and in fact there is simply nothing like it in the Ecuadorian museum of cultural history, located in Quito, that would suggest any of the known civilizations of this region. 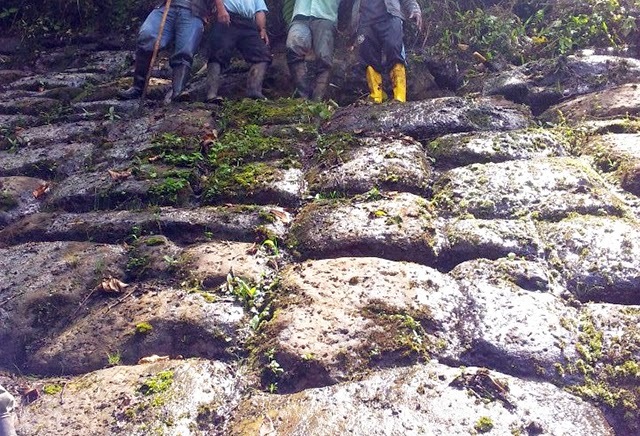 This has contributed to the strong prevailing suspicion that this is one of the legendary lost cities of the giants, well known in local Ecuadorian legends about the Amazon.